An often quoted parable has the "foolish builder" building on sand, but in reality many major cities are built on soft deposits  some in earthquake prone regions  and world-leading research at UTS will help make them safer. Tests conducted last week on UTS's shake table, the largest facility of its kind in Australia, gathered experimental data to support mathematical and computer modelling that together will set a new standard for constructing high-rise buildings in soft soil conditions. "Numerous high-rise buildings, similar to our own UTS Tower, have been built in earthquake prone areas around the globe supported by shallow or deep foundations in soft soil," said Dr Behzad Fatahi, research team leader and Senior Lecturer in Civil/Geotechnical Engineering from UTS's Centre for Built Infrastructure Research. "The Mexico City earthquake in 1985, Port-au-Prince earthquake in 2010, and many other recent earthquakes clearly illustrate the importance of local soil properties on the dynamic response of structures. They demonstrated that the bedrock motions could be significantly amplified at the base of a structure by over a factor of five after passing through the soft soil deposit." Dr. Fatahi said the UTS research team was developing an innovative procedure for determining the seismic characteristics of high-rise structures, founded on both shallow and deep foundations. "For the first time, based on both experimental and numerical results, a comprehensive and practical design criterion to predict performance of building frames considering non-linear seismic soil-structure interaction is being proposed at UTS," he said. "This research is providing a novel and accurate, but simplified, approach to predict the performance of structures built on soft clay or deep sand layers, including high-rise and mid-rise buildings, under earthquake action. "Accordingly, the safety of structures resting on the soft ground will be substantially increased. Through employing accurate prediction of building lateral drifts and base shear in the design phase of projects, the construction cost will be reduced and the performance and safety of structures will be enhanced." Last week's test placed a 1.5m-high model 15-storey building over about three tonnes of soft soil in a laminar soil container. Four earthquakes  scaled down to the model's size  were simulated on the shake table: Northridge (USA 1994), Kobe (Japan 1995) El Centro (USA 1940) and Hachinohe (Japan 1968). A series of sensors including 15 strain gauges, 10 accelerometers, and 6 displacement sensors were positioned inside the soil, on the structure and piles to monitor the response of the system. Two PhD candidates, Aslan Hokmabadi and Hamid Tabatabaifar, under the supervision of Dr. Fatahi and Professor Bijan Samali, worked for six months full time in the civil and geotechnical engineering laboratories to design and build the whole system. 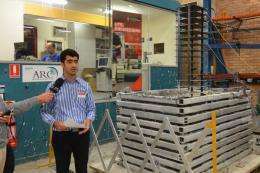 Dr. Fatahi said the results would be important to Australian engineers, as Australian standards did not currently include soil-structure interaction effects directly in the required design procedure. "Many Australian consultant engineers extensively involved in development projects in Asia Pacific countries with high risk of earthquakes should consider soil-structure interaction effects in design and construction. It is vital to guarantee structural safety and Australian engineering reputation."